This desert city of Rajasthan (India's north-western province) is an eye-catching site of well-fed camels and citadels. Being near to Delhi, it had to withstand the worst of Mughal invasions during earlier times. The exotic camel safaris, its gorgeous forts and the worship of thousands of holy rats at Mata Kali temple are some of the most interesting aspects of Bikaner. The camel festival held in the month of January is also an event worth witnessing if one wants to get the actual color of the place. Bikaner is situated in the north of Rajasthan. The city, just like Jodhpur, is surrounded by great walls. It has Ganganagar and Hanumannagar in its northern side whereas Churu lies in its eastern side. Nagaur, Jodhpur and Jaisalmer are in its south while in the western part it has the neighboring country Pakistan. It is situated on a slightly higher place (altitude 237 meters) and has an arid climate most of the year. Due to the geographic location of the city, it was one of the most important trade centers for the traders of west-central Asia. 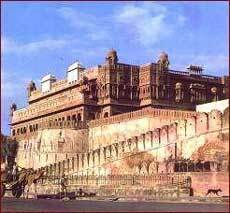 Just like the history of the entire state, Bikaner also has its own glorious past to talk about. It has examples of courage, motivation and happiness. It was in 1488 that a Rathore Prince, Rao Bikaji (a descendant of the founder of Jodhpur, Rao Jodhaji), established his kingdom here. It has faced many foreign intrusions and fought a number of wars with the Mughals and the British. Junagarh fort was built by a Mughal army general, Raja Rai Singh, in 1593. The courtyard of the fort along with the balcony, kiosks and windows are perfect examples of the artisanship of that time. The beautiful cutworks and dots on the red stones and the marbles are fascinating. The various parts of the palace-the Dewan-iI-khas, the Phool Mahal, Hawa Mahal, Badal Mahal and Anup Mahal-reflect the glorious architecture of Bikaner. Lalgarh Palace, built by Maharaja Ganaga Singh in memory of his father, is situated 3 km north of Bikaner city. The Rajasthan Tourism Development Corporation as part of their tourism promotion program has converted some portions of the palace to tourist hotels. Other parts of the palace have been converted into a museum named as the Sadul Museum to preserve the glory of the yesteryears of Rajasthan in general and Bikaner in particular. Ganga Golden Jubilee Museum is one of the best museums of Rajasthan with some fabulous collection of antiques and artilleries. The Camel Research Farm carries out breeding and training of camels-the only fighting force and medium of transportation in the past. The Gajanir Palace and the wildlife sanctuary, 32 km from the main city, is also a place worth visiting. A large number of wild species are available like the nilgai, wild boar, chinkara, etc. This place was the summer resort of the former kings. Kalibangan is an archeological site containing remains of the pre-Harappan and Harappan civilizations. This is a much-recommended site for historians and others who want to gain an insight of India's rich heritage. The Camel Festival, held in the month of January, is the most exciting festival. Competitions related to camels like camel races, milking, dancing, etc., make this festival even more interesting. Kolayat Festival is the holy festival when the people take a dip in the holy water of the Kolayat Lake. It normally takes place on the full-moon night of the Hindu month Kartik (November). Gangaur Festival, dedicated to Goddess Parvati, is an 18-day long spring festival celebrated during the month of April. The typical Rajasthani products like metal ware, blue pottery, Rajasthani paintings, puppetry, embroidered fabrics, block-printed fabrics, etc., are easily available in the local markets of Bikaner. 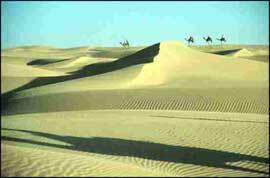 The best time to visit Bikaner is between October to March. Metre Gauge connection is Jaipur & delhi. Delhi is 10 hrs. drive.